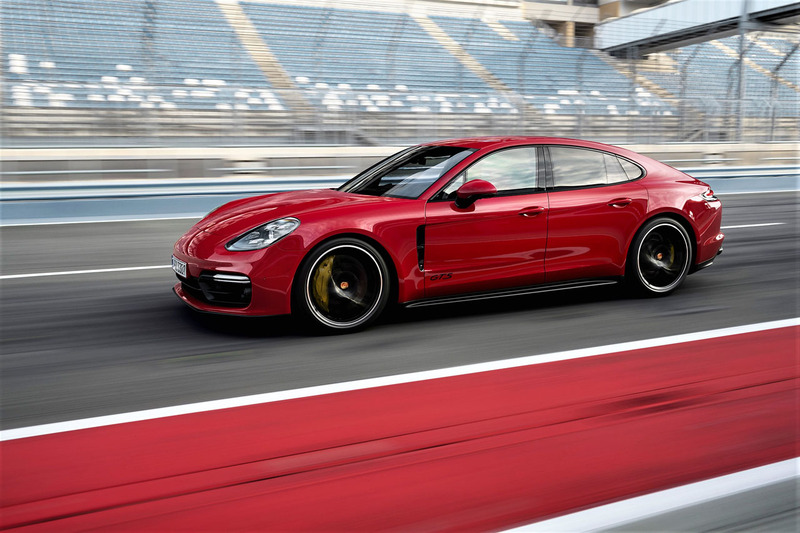 Now moving into the third year of its second-generation redesign, the thoroughly improved Panamera four-door coupe is once again available in the purest of Porsche performance trims, GTS. 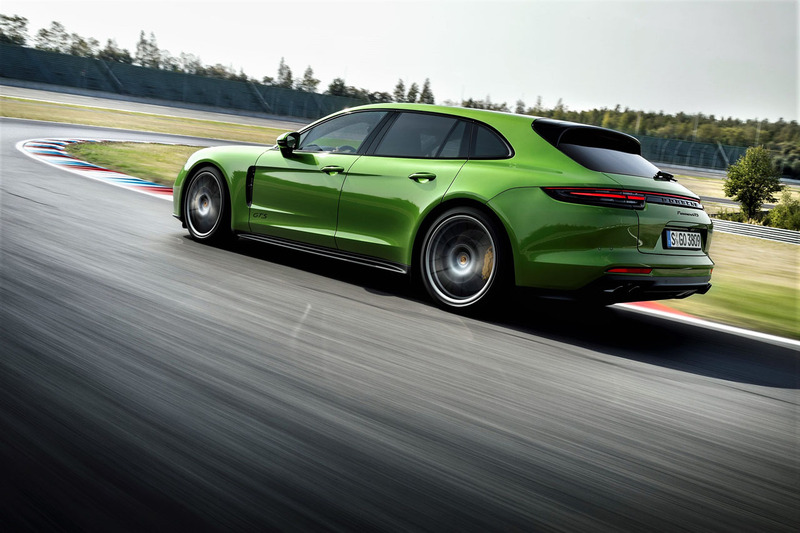 The new GTS model slots in between the $118,500 Panamera 4S and $116,800 4 E-Hybrid models and the $172,500 Panamera Turbo line in both price and performance, with a starting MSRP of $146,200 plus freight and fees in the regular five-door liftback body style or $153,300 in Sport Turismo guise. 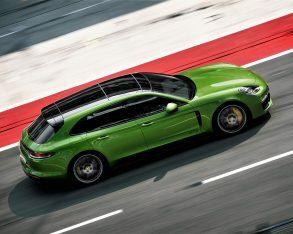 Unlike the previous Panamera GTS that stuffed a big naturally-aspirated 4.8-litre V8 with 440 horsepower and 384 lb-ft of torque under the hood, the new one uses the same twin-turbocharged 4.0-litre V8 engine found in the latest Panamera Turbo, albeit detuned to make 453 horsepower and 457 lb-ft of torque, which is 13 horsepower and a sizeable 73 lb-ft of torque more than the outgoing model, resulting in a zero to 100km/h sprint time of just 4.1 seconds, compared to 4.4 seconds with the previous GTS as well as the current 440 horsepower Panamera 4S (or 4.2 seconds with the optional Sport Chrono Package), 4.6 seconds with the 462 net-horsepower 4 E-Hybrid, and 3.8 seconds (3.6 seconds with Sport Chrono) with the 550 horsepower Panamera Turbo. 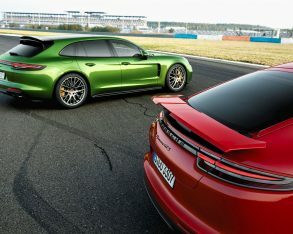 The Panamera’s standstill to 100km/h straight-line performance ranges from 5.7 seconds with the base 330 horsepower rear-wheel drive Panamera to 3.4 seconds in the almighty 680 net-horsepower all-wheel drive Turbo S E-Hybrid, so the new GTS fits right into the quicker side of the equation, while it also powers from zero to 160km/h in just 9.6 seconds before attaining a top speed of 292km/h (289 km/h for the GTS Sport Turismo). 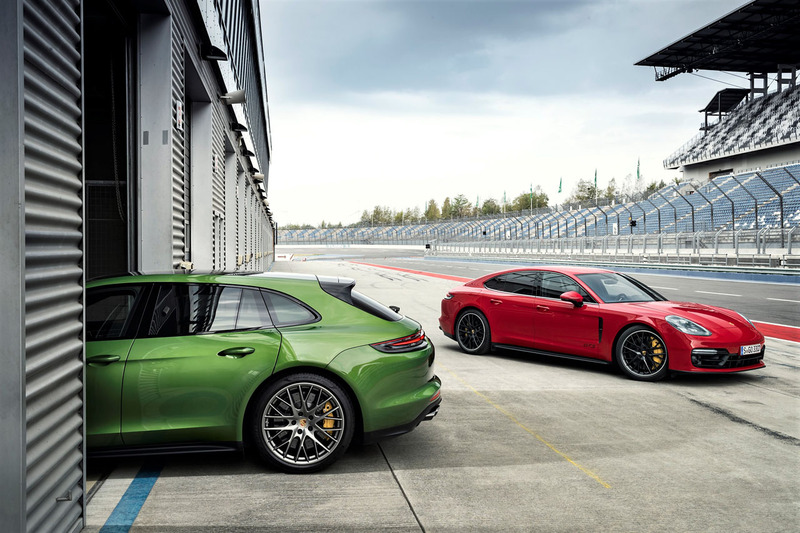 By comparison, the 4S takes 10.3 seconds to arrive at 160km/h and peaks at 289km/h, whereas the Turbo S E-Hybrid hits the 160km/h mark by 7.6 seconds and maxes out at 310km/h. 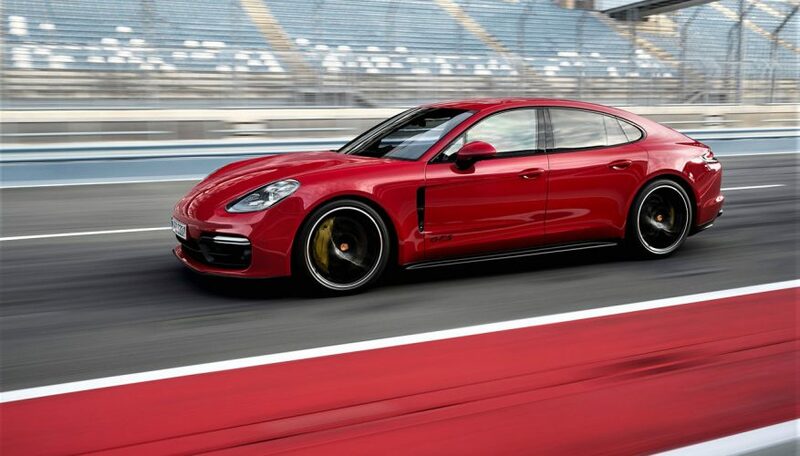 Like all other Panamera models, the new GTS utilizes Porsche’s new in-house designed and built eight-speed PDK dual-clutch transmission, while Porsche Traction Management (PTM) all-wheel drive makes sure that all available power is put to efficient use. 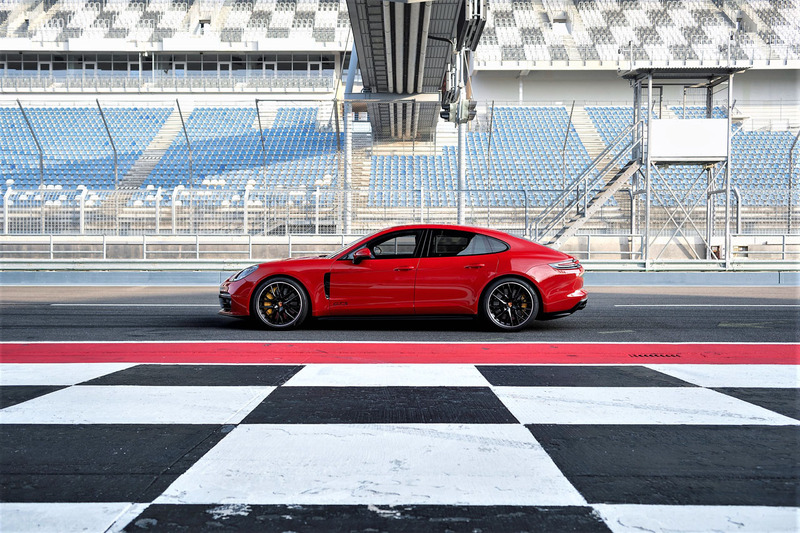 Being that most owners will never see the top speed of any Panamera, with even the base model capable of 264km/h, the GTS sets itself apart from its siblings with styling and handling. 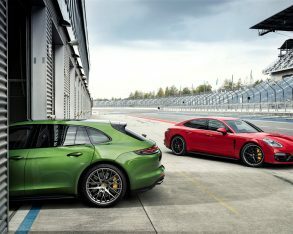 With respect to the latter, the new model utilizes a standard three-chamber adaptive air suspension preset 10 millimetres lower than the regular Panamera, with the standard Porsche Active Suspension Management (PASM) system modified for an even sportier setup than usual. 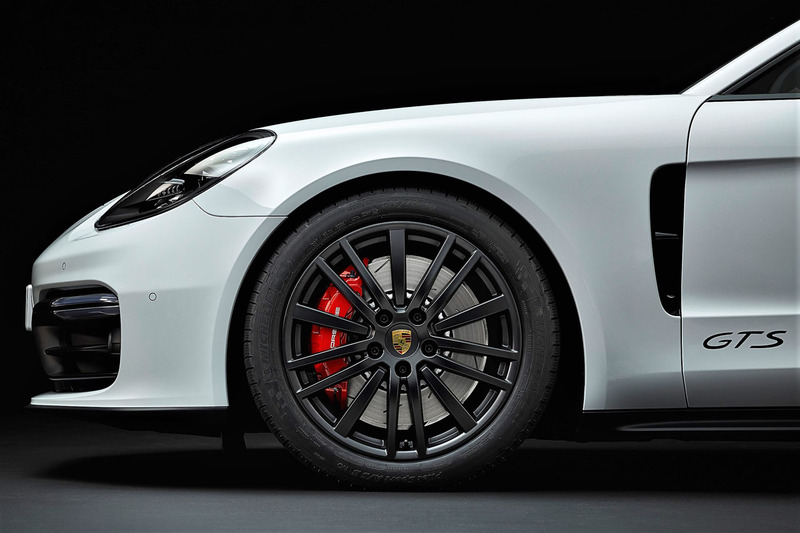 Larger 390-mm front and 365-mm rear disc brakes harness all the GTS’ forward momentum, making sure the big four-door is as capable at stopping as it is at going. 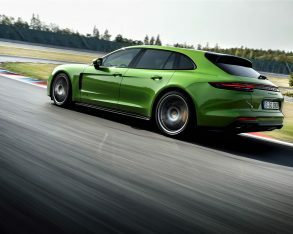 If you don’t happen to see the italicized “GTS” script on the lower front door panel or rear liftgate as it speeds past, the new model is as easy to spot from a distance as other GTS models in the Porsche lineup thanks to blackened exterior trim in place of body-colour and metal brightwork. 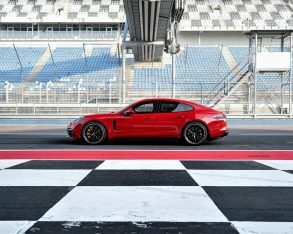 Additionally, a standard Sport Design package means that a black lower lip spoiler, side skirts and rear diffuser get added, while grey accented headlamps and taillights maintain the darkened theme. 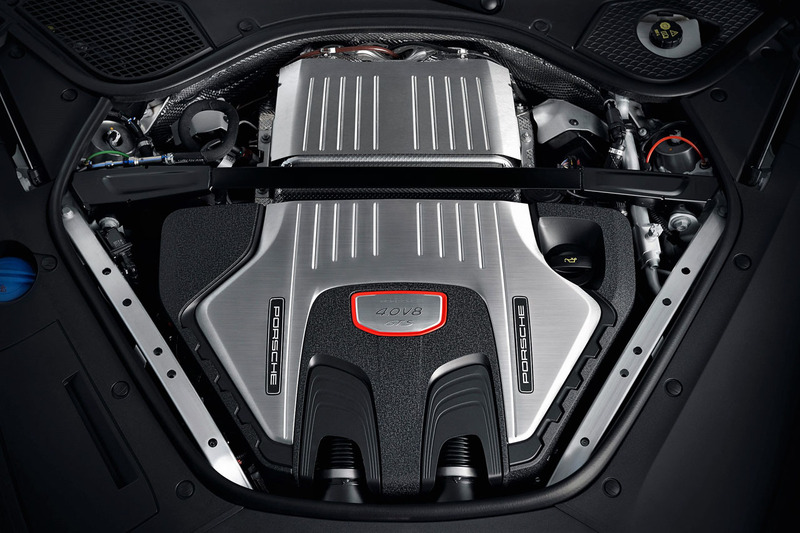 Lastly, glossy black 20-inch multi-spoke Panamera Design alloys round out the exterior look. Inside, trademark GTS design elements get applied generously, particularly soft black suede-like Alcantara and beautiful anodized aluminum accents. Both are applied to the standard sport steering wheel, with just the former dressing up each insert of the otherwise leather sport seat upholstery front to back. Alcantara gets used for all armrests as well. 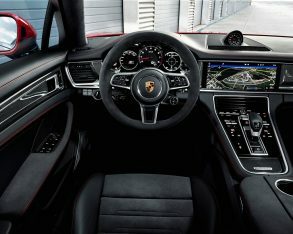 Additionally, as part of the standard GTS Interior Package, Porsche covers the steering wheel hub, the upper and lower sections of the dash including the glove box lid, the edges of the centre console, and each door panel in its entirety with soft leather for a downright hedonistic experience. 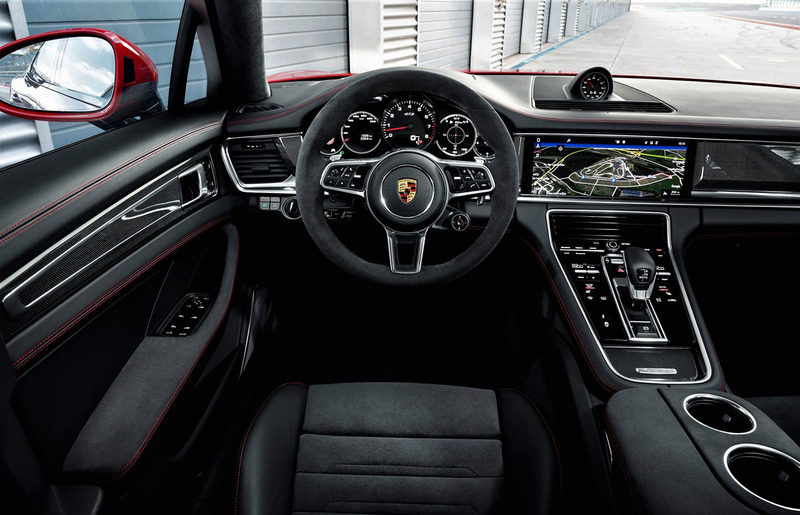 The aforementioned sport steering wheel includes its own heatable element to match those in the front seats, plus each spoke is filled with multifunction switchgear that includes Connect Plus for accessing a variety of digital services, while at the backside of each spoke you’ll find a set of metal paddle shifters. 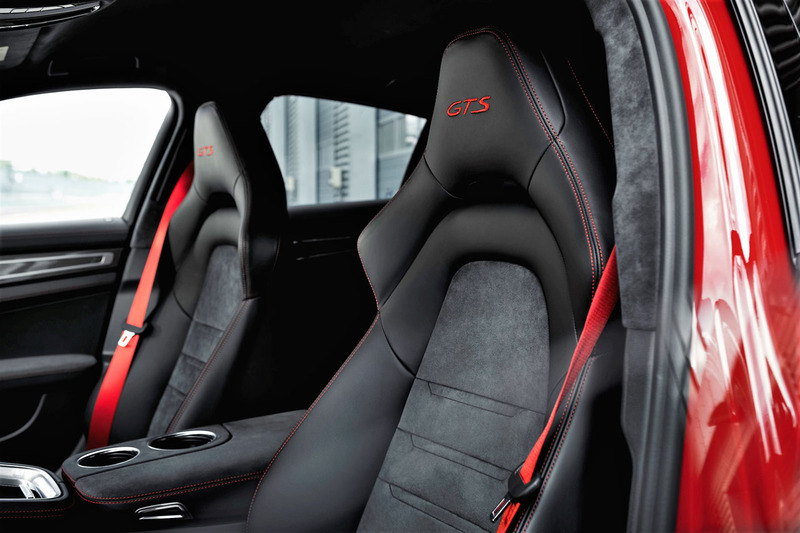 The aforementioned GTS Interior Package can also be combined with a Carmine Red or Chalk grey two-tone effect for an extra $3,980, or if you want to personalize the look further you can choose from myriad leather colourways. 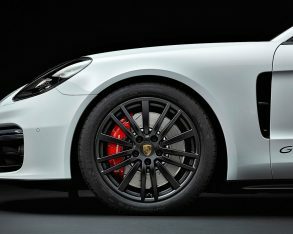 Porsche also offers the ability to upgrade the interior with a unique tachometer face, Carmine Red or Chalk contrast stitching throughout the interior, embroidered GTS headrest logos in Carmine Red or Chalk, matching seatbelts, etcetera. 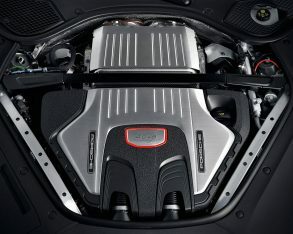 All of the special GTS features get added to a new Panamera that was much improved for its second-generation makeover, with all 2019 models including the Porsche Advanced Cockpit digital gauge cluster as standard, not to mention advanced driver assistance systems like the highly sophisticated Porsche InnoDrive adaptive cruise control system with stop and go capability plus more. 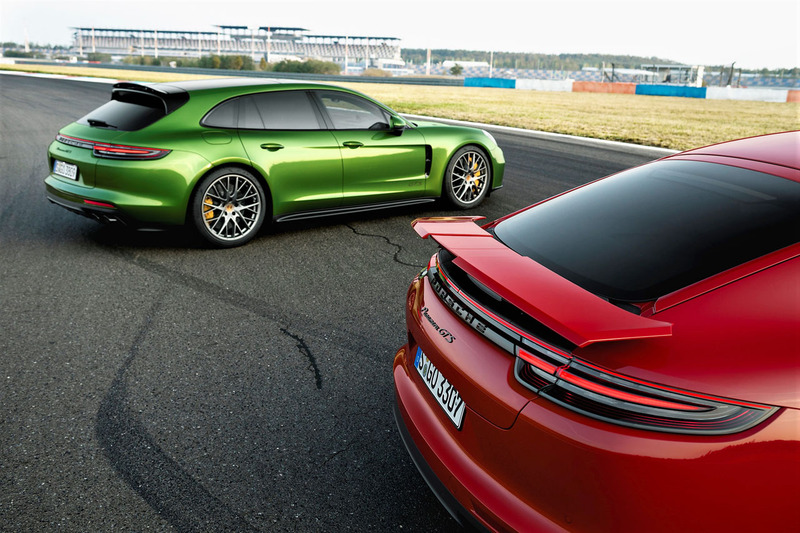 Also, new to the Panamera range yet standard with the GTS is a full colour head-up display unit that projects vital information onto the windscreen ahead of the driver. 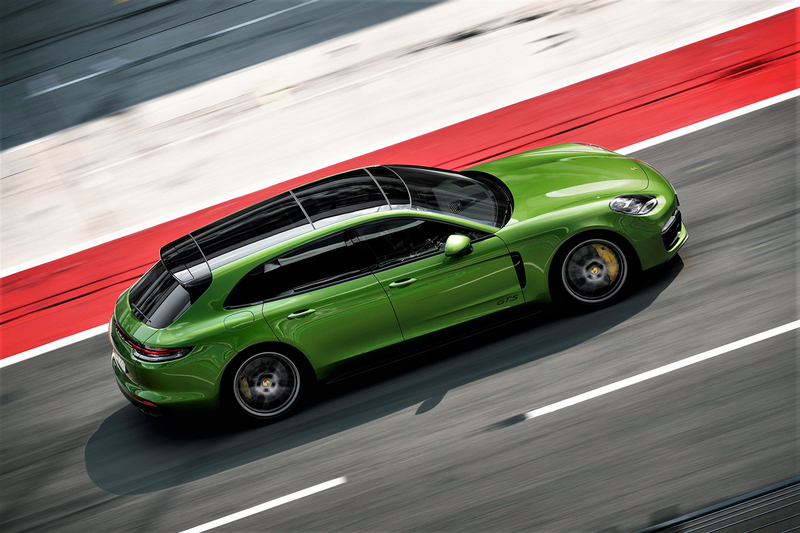 The new 2019 Panamera GTS is available now at Porsche retailers across Canada.